On Wednesday last, 19th January, I got up at 5am. I headed straight for the kitchen for a glass of ice cold orange juice to wake me up. As I arrived downstairs I wondered who had left what light on. The kitchen was glowing in the darkness of the pre dawn. I suspected a laptop or muted TV. But no. Directly above one of the roof windows January’s Wolf moon was spilling ivory light all over the floor and up the walls. An hour later I was walking down South Anne Street and again the moon called to me as she sailed slowly over the Westbury Hotel lending the silent city an air of magic. I stopped to honour her magnificence and attempted to capture it on my phone camera. I wondered what the moon was trying to say to me. My early morning interview on Newstalk Radio done, I headed back towards Grafton Street in search of breakfast. As the moon sank slowly out of sight ahead of the rising winter sun, radios were beginning to pick over the previous nights drama in Dail Eireann, where Brian Cowen had won the vote of confidence in his leadership of Fianna Fail. Michael Martin’s challenge had certainly never looked very threatening. He had cut a lonely figure in a bare hotel room at his press conference. In fact Fianna Fail’s efforts to oust its leader was like watching a tribe of pygmies trying to down a bull elephant with bows and arrows. The only talking point on Wednesday morning was Mary Hanafin’s apparent crisis of conscience or confidence which led to her picking up an arrow and launching it gently in the direction of the bullish Cowen. Even for a girl it was a rubbish throw and its only effect was to make her look very silly indeed. Delivery trucks lined up on Grafton Street and the street echoed with the sound of shutters being raised signalling the beginning of the day’s trade. I left to head back to my normal life and Wednesday routine. As evening fell, Grandmother Moon rose into the sky again, looking even more powerful and beautiful. Her round face seemed to wear an enigmatic smile as she presided over more mayhem. By 9pm the first of a waterfall of resignations was announced as Mary Harney bade farewell to her inglorious tenure as Minister for Health. By 11pm, the moon was high in the sky and three more ministers vacated their positions. Our Government seemed to be melting in the moonlight. 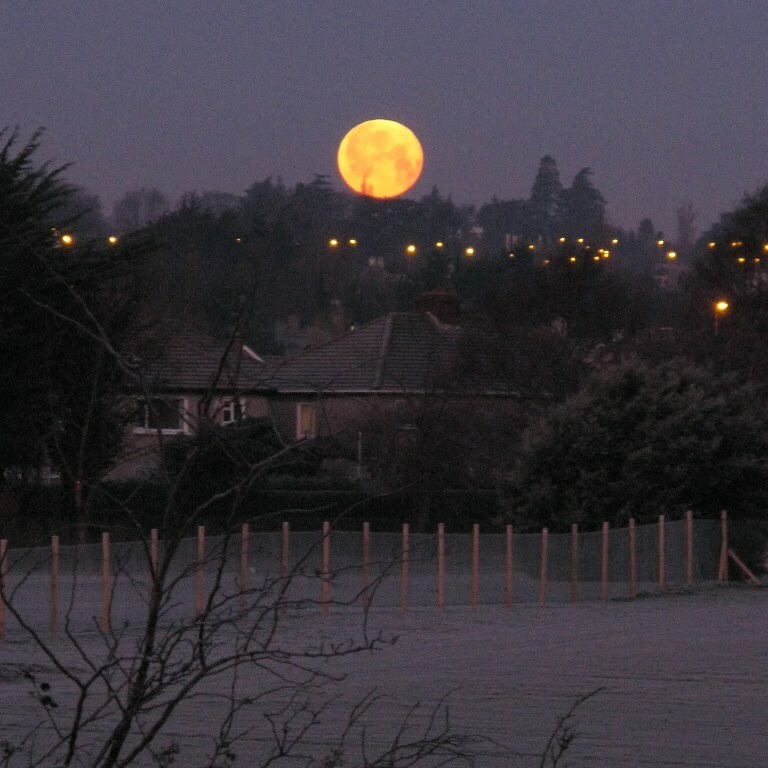 By the time I awake on Thursday morning the moon is low in the Western sky and wearing a warm buttery rich hue. I am sure she winks at me as I try once more to capture her last moments of stunning beauty. In Dail Eireann chaos has descended as Biffo attempts to promote lesser spotted TDs into ministerial roles. It was clearly seen as a political stunt to provide some much needed positive PR to elected representatives before they have to knock on doors around their constituencies and it backfires spectacularly. The Green Party throw a spanner in the works. At around the same time it seems that the comatose front bench finally wake up and their barely hidden anger is captured by the amazed political hacks who witness it. There are even reports of Mary Hanafin using the ‘f word’. The day ends with a reduced cabinet double jobbing all over the place. By Thursday night, Fianna Fail seems to be eating itself. Conor Lenihan gives a stunning performance on Vincent Browne’s programme as he sells both his leader and his brother up the river. His anger explodes causing his face to glow crimson as he attempts to give birth to his new self right there on live TV. As I head to bed, I search the sky for the moon. She is invisible under a thick blanket of cloud. But I hear her message. Her work is done here…. for now. Goddess Moon, Grandmother Moon – symbol of feminine power and energy is now waning. But she will be back again in 28 days. I can’t wait. Great photo – shame about the government !! Without knowing shite about the politics I got so much from this story. Let 'she who rides fatly in the night sky' continue her work! Extraordinary post Barbara … you should run in the next election! We could do with women like you in power …. just imagine …. Barbara Scully … our new Taoiseach! I agree with Paul – a really great photo. But also a great blog which was funny but sad also as it shows what clowns we have to govern us. It's a pity that the election is set for the 11th March as the moon will be in her first phase. Now if it were to be held on the 19th March the moon would be full and who knows what would transpire! Sorry to hear about your political upheavals but I so love that photograph of the moon. I've tried taking moon photographs and they come out as a blur but then our moon has never looked quite as beautiful as that one. Brilliant piece of writing B! When I left Ireland for Tenerife only on Tuesday last, all was fine. Where did it all go wrong? I know a week is a long time in politics but three days?! Just as Murphy's Law was replaced by Sod's law, Cowen's Law or luck, may have to replace them all. I would really feel good if I really felt we had a real alternative… It will come as no surprise for you to learn that Tenerife is as magical as ever. Someone explained it in mystical terms – 'you don't discover the island, it discovers you'..maybe. Well done again! P.
I love your post. The “lunar” parallels between the beyond madness going's on with our country's rulers and the movements of the moon, are sublime. Let's hope that when She reappears in 28 days time, we will all be put out of our misery and a fresh set of faces will be steering the ship. Nor – we will have to wish very hard that the election is placed right in the next full moon!! Mari – absolutely. We will see what happens. It would be very funny if it werent so serious. A lovely take on the political situation, Barbara. Let's hope the moon next month brings great change and promise. Beautiful photo!